Location of Encanto highlighted in red. Encanto Village is one of the 15 Urban villages that make up the City of Phoenix, in Arizona. The village includes the city's midtown and uptown districts, as well as the popular Encanto neighborhood, its namesake. In 2010, Encanto had a population of 54,614 residents. The community is located in Central Phoenix. At about 8 square miles, it is the city's smallest urban village by area, and, consequently, one of its densest. The western border of the village is the I-17 Black Canyon Freeway, and the southern border is McDowell Road. The Grand Canal makes up the northern and eastern border. The core of the Encanto Village is the Park Central Mall; and the Arizona State Fair, on whose fairgrounds the Arizona Veterans Memorial Coliseum is located. It was the original home of the Phoenix Suns, the city's NBA franchise. Other points of interest include Encanto Park, Steele Indian School Park, and Phoenix College. 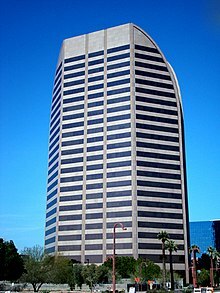 The village includes the city's Midtown and Uptown districts, which, combined with nearby Downtown, make up the largest center of employment in the state of Arizona. Encanto also includes the southern portion of the Melrose District (with the northern portion in neighboring Alhambra), which has an increasing number of gay and lesbian bars. 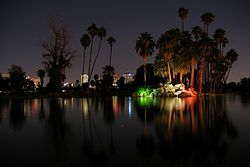 Wikimedia Commons has media related to Encanto, Phoenix. This article related to Phoenix, Arizona is a stub. You can help Wikipedia by expanding it. This page was last edited on 26 November 2018, at 16:29 (UTC).